be confessed, is a little difficult to follow, due to its long uninterrupted inhabitation. The current form of the castle, although quite changed by modern intervention, basically crystallised during the Frankish and first Venetian occupations from the 13th to 16th centuries. The hill of Palamidi, which takes its name from the Homeric hero Palamidis, does not seem to have been systematically fortified until the second Venetian occupation. 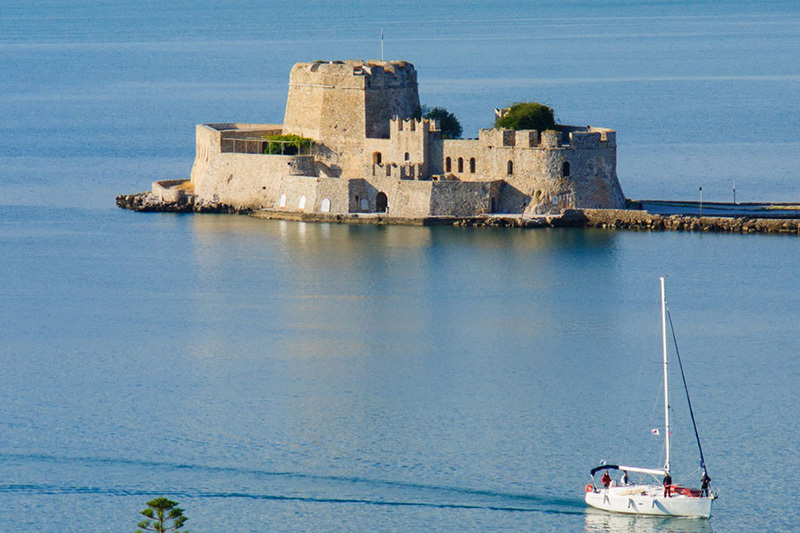 The wonderfull fort on the sea, in the port of Nafplio which has remained known by its Turkish name‘Bourtzi’, meaning tower, has become Nauplion’s trademark. The fort on the sea, which has remained known by its Turkish name’Bourtzi’, meaning tower, has become Nauplion’s trademark.On this small island, which is in the middle of the city’s harbour, there was once a Byzantine church consecrated to Aghios Theodoros. The Venetians, having understood the strategic importance of this site for the protection of the port, built a tower on the rock in 1473.During the time of the Greek revolution, the Bourtzi was known as Casteli or Thalassopyrgos, sea tower.It was here for a short while in 1826 that the Greek government sought shelter, when the rebellious nation fell into civil strife.The Bourtzi was active as a fort until 1865.It then became the place of residence for the executioners who carried out the death sentences on the prisoners in the Palamidi. In 1935 it was turned into a hotel after alterations by the German architect Wulf Schaeffer. Today one can visit the Bourtzi by boat from the seafront. The fort of the Palamidi, which has been preserved in excellent condition, is one of the greatest achievements of Venetian fortification architecture.The hill of Palamidi, which takes its name from the Homeric hero Palamidis, does not seem to have been systematically fortified until the second Venetian occupation. The construction of the fort was basically carried out during the time of Venetian General Superintendent of the Fleet, Agostino Sagredo, from 1711 to 1714, marking the fort not only as a major feat in terms of its fortifications, but also in terms of the speed with which it was constructed. It was from the Palamidi that the liberation of the city from the Turks began, after a long siege. On the night of 29th November 1822, a unit of Greek rebels, led by Staikos Staikopoulos, launched a surprise attack and seized the Palamidi. 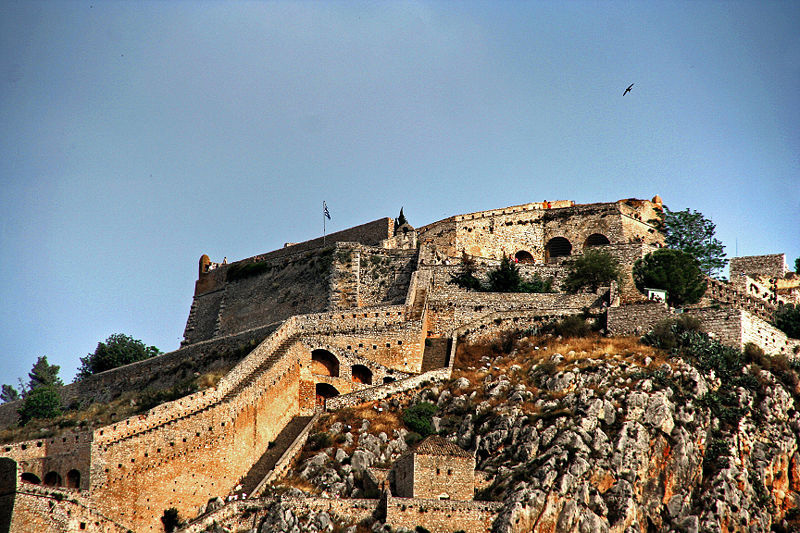 Dimitrios Moschonisiotis was the first to set foot inside the fort from the bastion of Achilles. Not only was the Palamidi a great fortress, it was also the site of a dismal prison. In 1833, during the time of the regency, when King Otto was still a minor, one of the leaders of the revolution,Theodoros Kolokotronis, was imprisoned here on the supposed charge of high treason. The Miltiadis bastion, one of the largest, was converted into a prison for serious criminals in around 1840, and it remained in operation until around 1926. The Aghios Andreas bastion was also used as a prison, but conditions here were somewhat better.Today, the fort can be accessed either by the road which terminates at the eastern gate or by the famous steps which are located on the western side to the east of the Grimani bastion. The Land Gate was built in 1708, by the French engineer, and succeeded the earlier gate dating from the first Venetian occupation. It was the only entrance to the city by land and, in fact, the gate would be closed at sunset. Whoever remained outside after that time was obliged to spend the night outside the city, usually in the Pronia suburb. In front of the gate was a moat filled with seawater, which ran along the eastern wall of the city. Access was only possible via a wooden drawbridge. The gate was gradually demolished between 1894 and 1897. In around 1894 the moat was also filled in. Today, the façade of the gate has been reconstructed following a special study of its original form. Basically, the structure of the gate is simple: an arch with two pillars on either side; while at the highest point there was a statue of a lion, the symbol of the Venetian state.Near to the left-hand pillar there is a plaque, which has been inlaid into the wall, commemorating the liberation of the city by the Venetian general-in-chief, Francesco Morosini in 1687. The Bastion of “Pende Adelphia”, or Five Brothers,is the only bastion to escape demolition and surviveto the present day. It is on the North West slope of the Acronauplia and owes its name to the five cannons, all the same size, that reinforced its defences. This bastion protected the western section of the lower city and the harbour, in combination with the Bourtzi.It was probably constructed by the Venetians at around the end of the 15th century.According to some researchers, it must date from later, during the time of the Turkish occupation, as the construction demonstrates some roughness and lack of skill. In Michael Iatrou Street between the church of Aghii Pandes and the modern graveyard, the visitor will find an exceptional sculptured monument, one of the most important of 19th century Greece; known as the lion of Bavaria, which dates from 1840 -1841. The lion, which is carved into the rock on a monumental scale, seems to be sleeping. The sculptor of this beautiful monument was the German, Christian Siegel, who was the first professor of sculpture at Athens Polytechnic. The model for the work was the Lion of Lucerne, by the famous Danish sculptor, Bertel Thorwaldsen. The Parliament building, which is located in the south-west sector of Syntagma Square,holds a special place in Greek history, as it was here that the parliament of the rebellious Greeks met. It dates from 1730, the time of the second Turkish occupation of the city, and was originally built as a mosque. It was built in ashlar masonary and consists of a square chamber with a large dome.It is a characteristic mosque of the late Ottoman architectural period,with its heavy proportions and bulky dome. To the west there was once a domed portico, but this fell down during an earthquake at the beginning of the 20th century. After the liberation of the city from the Turkish yoke the mosque was used to house the Greek Parliament, from the autumn of 1825 to the spring of 1826, after suitable remodelling by the architect Vallianos. This was its most important use, and the name of ‘Vouleftiko’ or ‘Parliament’ has remained in use to the present day.Today the Parliament has been restored in an exemplary fashion by the Greek Ministry of Culture and is used as a conference centre,which, apart from conferences, plays host to many other cultural events. The Municipal Gallery of Nauplion was recently moved to the ground floor,bringing with it an interesting collection of the works of Greek artists. The works are mostly donations from the Nauplian Rotary Club, and the Nauplian local, Nikolaos Karagiannis. Syndagma Square, the most important and historic square in Nauplion, comprises the centre of the city. It is assumed that from 1540, the time of the first Turkish occupation, the Turkish commander of the Peloponnese, Mora-Pasha, had his seraglio here. Today, one can see many important historic buildings in the square, such as the Venetian Warehouse of the Fleet, which today houses the Archaeological Museum; the parliament, former mosque of Aga-Pasha and finally the Allilodidaktiko School, which came to be known as the ‘Trianon’. The square was also once home to the residences of many of the great fighters of the Greek revolution, such as Nikitaras and Theodoros Kolokotronis. The episode known to modern Greek history as ‘Psorokostaina’ took place here. On the spot where the National Bank now stands, there was once the home of Kalliopi Papalexopoulou, which was built after the liberation of the city from the Turkish yoke. Mrs Papalexopoulou, the wife of the mayor of Nauplion, Spyridon Papalexopoulos, was at the head of the revolutionary movement for the removal of King Otto from Greece. In fact, it is said that her home was the centre for the organisation of the Nauplian revolution, which lasted from February to March 1862. Today, there is a monument to her memory outside the National Bank. This square takes its name from the figure who above all others is synonymous with the history of the city: Ioannis Kapodistrias, the first governor of the modern Greek state. More or less on the spot now occupied by the park today there was the bastion of Dolfin, or San Marco, which was demolished as part of the wider demolition of the walls and bastions of the lower city. The statue of the governor, the work of the sculptor Michael Tobros, was placed in the square in 1932 and is carved from marble. Kapodistrias is shown standing, dressed in formal attire, leaning lightly on the trunk of a tree. The centre of the park is dominated by a monumental statue on horseback: the hero of the Greek revolution,Theodoros Kolokotronis.It is one of the most important works of neo-Hellenic sculpture and was created by the Tinian sculptor Lazaros Sochos in Paris. It is made of a copper alloy and is placed on a monumental stone pedestal. The old man of Moria’,as Theodoros Kolokotronis was known, is depicted on horseback, holding the reins in his left hand and showing the way forward with his right.The whole work is impressive and the proud form of Kolokotronis exudes an air of greatness. The Archaeological Museum is accommodated in the imposing in size as well as strict in symmetry, stone-built Venetian structure which covers and encases the central, Syntagma Square on its west side. It was first built in 1713, during the second reign of the Venetians, under the Naval Proveditore Augustine Sagredo to be used as the navy’s depository, according to the marble inscription fitted on the building’s frontage, written in Latin. It is widely acknowledged as one of the best well-preserved Venetian structures in the whole of Greece. The permanent exhibition spreads along two halls of the same facade, within the building’s two floors and is then historically divided into several themes, from the remotest pre-historical exhibit to the period of antiquity, demonstrating the walk and the mark of every civilization setting foot in Argolida Prefecture. The museum’s most exquisite piece of archaeological finds still remains to be the Bronze Suit Armor of Dendra region, exhibited in a specially designed area together with the rest of the breathtaking tools which were excavated such as, armor equipment belonging to the soldier dressed in that armor, bronze and clay jugs. Located in the area where the first Army Cadet School were, the War Museum was inaugurated at the end of 1988.(Amalias,22). The Museum is a directive of the history of the Army Cadet School and that of contemporary history of the Greek state, the participation of the citizens of Argolida prefecture in all rebellious acts, from the Greek Revolution against the Ottoman Empire to the liberation from the occupation troops. The Peloponnesian Folklore Foundation “Vasileios Papantoniou” of public benefit was established back in 1974 and is located in Nafplio. Its primary aim is the research, study, demostration and conservation of the Hellenic cultural activity. It is located on King Alexander’s 1 street and has been awarded with the European Museum of the Year Main Award (EMYA) in 1981.The year 1999 was the time that the Foundation celebrated its first quarter of the century birthday, in an unforgettable ceremony. The newly presented exhibition “The Best of PFF” (Peloponnesian Folklore Foundation) aims at demonstrating the depth and wealth of the foundation’s collection, which numbers more than 27.000 different items. Since 2006, the exhibition entitled “Hellenic Urbanism: Nafplio 1822-1922” has opened its curtains in the already renovated interior of the foundation. Prepared to be a permanent exhibition, it mainly encompasses urban Nafplio and the peripheral regions. Under the management of Marina Lambraki-Plaka and with the initiative of the prominent citizen of Nafplio and ex-president of the State Audit Council, Apostolos Botsos, was the department of the Art Gallery in Nafplio founded in 2004.The building, a courtesy of the Municipality of Nafplio,was restored and equipped museum-like with the aid of the public welfare institution: “Alexandros S. Onasis”. The neoclassical building where the gallery is held,houses a collection of works of art dedicated to the liberating cause of the Greeks against the Turks (Th. Vrizakis, F. Margaritis, Dion. Tsokos, N. Gyzis, Nik. 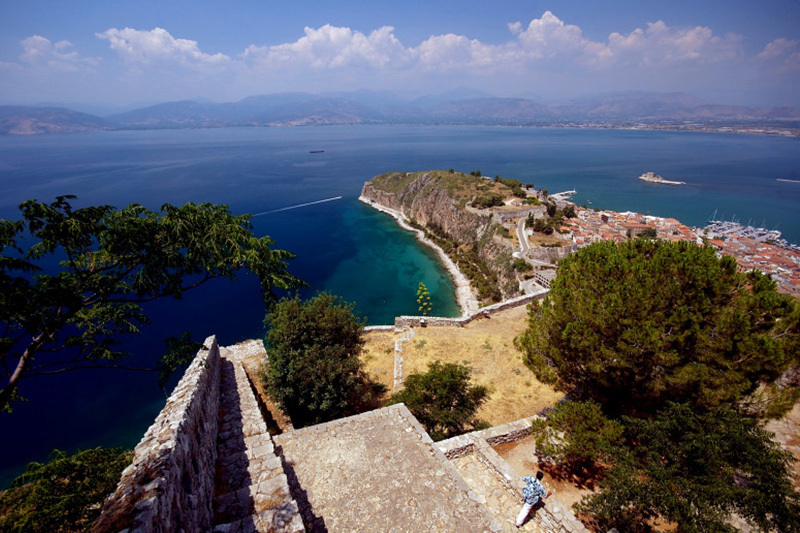 Lytras and more) which underlines and provides the aesthetic element to the historic note of the city of Nafplio. The Department of the National Art Gallery also houses a number of albums and art books alongside a hall for short-term exhibitions, offering the museum the dynamics and the attraction needed to define its functionality. The rocky peninsular of the Acronauplia comprised the walled settlement of Nauplion from ancient times until the end of the 15th century. The Acronauplia walls bear witness to its rich history, which it must be confessed, is a little difficult to follow, due to its long uninterrupted inhabitation. The current form of the castle, although quite changed by modern intervention, basically crystallised during the Frankish and first Venetian occupations from the 13th to 16th centuries. Evidence of a pre-historic settlement has been found, and on the west side, a section of the ancient polygonal walls from the 4th century BC has survived. There are also remains of the walls from the Hellenistic and Byzantine periods. During the first Venetian occupation, and more specifically in 1470 during the command of Vettore Pasqualigo, the Venetians, threatened by Turkish raids, proceeded with repairs and extensions to the fortifications of the Acronauplia, under the supervision an important engineer of the time, Antonio Gambello. The Castello di Toro is still in good condition today and, after climbing the steps from the Catholic church, one can admire the imposing round tower with its crenellations, which protects the city gate; an excellent example of late renaissance style. In 1829, Ioannis Kapodistrias, the governor of Greece, created a large barracks and a military hospital on this site. In 1926, the infamous prison was transferred from the Palamidi and housed in the barracks created by Kapodistrias. In 1937 these prisons also became civil and operated there until about 1960. Today, one can visit The Acronauplia climbing east from Staikopoulos Park through Arvanitias Square, or climb the steps from the Catholic church through the Castello di Toro.